A People’s Hearing on Racism and Police Violence was an event organized at a grassroots level by community members and political organizers, offering space for the public to share testimony about the racism and violence of law enforcement. It was a chance to hear from witnesses and victims, their friends and family members, activists, organizers, and others. Giving a platform to individual and shared experiences of repression, we worked – and continue to do so – to indict the imperialist, white supremacist and capitalist power structures, and to document the people’s case throughout our communities. We, as organizers, are not lost on the fact that this transcription is being published on the two year anniversary of the police murder of Raheim Brown. We were lucky to have members of Raheim’s family as guests, sharing the story of their trauma even before they buried their son and brother. Two years later, responsibility has not been taken for Raheim Brown’s death. There has been no financial settlement, no criminal charges, and police officers (including the officer who fired the deadly shots) continue to patrol Oakland elementary, middle and high schools. In that time, police officers in Oakland have continued to kill, taking the lives of numerous Black and Brown young. We’re publishing this because the survivors and witnesses of police violence and state repression do not have to be isolated. When experiences are shared, we can gain a significant edge in the struggle for justice. A People’s Hearing on Racism and Police Violence, which took place on February 19th and 20th of 2011, was a move toward the offensive, linking many sides of the repressive state in order to strengthen our movements against it. one young woman appearing in E. Philip Black’s video linked below. As you may have heard or seen, The Malcolm X Grassroots Movement has researched and released a report entitled “Report on the Extrajudicial Killing of 120 Black People” that shows that every 36 hours a Black man, woman or child is murdered by the police, private security guards, prison guards or vigilantes in the US. One element of structural change that the Malcolm X Grassroots Movement has been advocating for to address police terrorism and other forms of containment (including mass incarceration) is a National Plan of Action for Racial Justice and Self-Determination. As a central component of the No More Trayvon Martins campaign we have been agitating for this demand to be met by the Federal government. The agitation has mainly served the purpose of educating a broader audience and serving notice to the Federal Government. But, we are clear, that if this plan is to mean anything and to have any real impact, it is something that has to be developed and implemented by oppressed peoples themselves. 1. 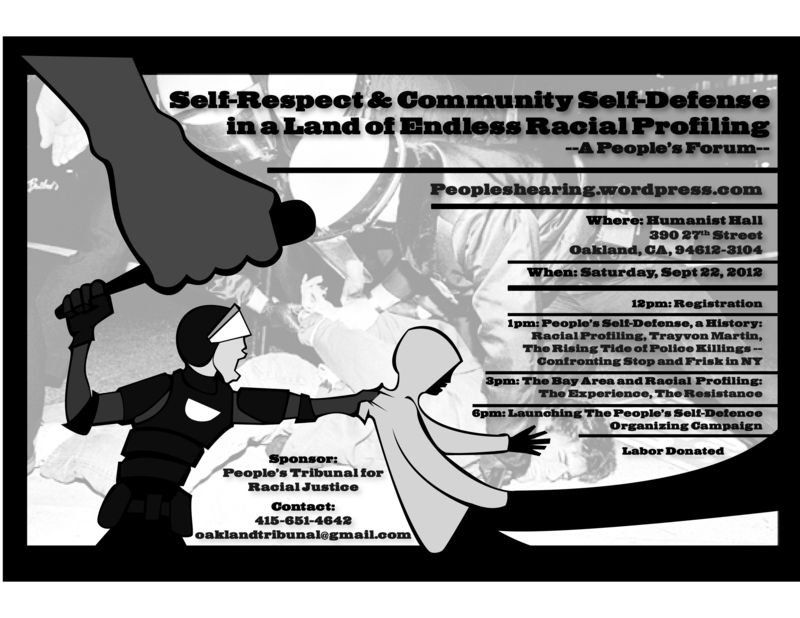 The formation of Black Self-Defense Networks to defend our people and combat police terrorism. These Networks should seek to build Copwatch programs, engage in mass rights based education trainings for the community, serve as first responders to acts of Police Terrorism, and help coordinate mass resistance to these acts via mass mobilizations and direct action. These Networks should also be encouraged to engage in offensive campaigns, such as referendums to institute Police Control Boards. 2. The formation of People’s Self-Defense Networks to defend the lives and interests of all oppressed peoples’ and exploited classes against various forms of state terrorism. These People’s Self-Defense Networks would work as multi-national alliances to engage in a broad manner all of the tasks mentioned above to defend oppressed peoples and targeted communities, such as LGBTQ2GNC communities, against institutionalized racism, white supremacy, institutionalized sexism, patriarchy and state repression be it racial profiling, gender profiling, stop and frisk, mass incarceration, or mass deportations. 3. The launching of campaigns for local referendums to institute Police Control mechanisms – i.e. community based structures that have the power to hire, fire, subpoena, and discipline the police. 4. Forming People’s Assemblies, on local, city-wide, and regional levels to engage in program and demand development initiatives that will structure the development of a Peoples’ National Plan of Action for Racial Justice and Self-Determination and the broad implementation of people’s programs for self-defense and mutual aid. People’s Hearing Keynote: Rachel Jackson from proj-ect PRO:JECT on Vimeo. Since the release of our Report on the Extrajudicial Killing of 120 Black People on July 9th, the Police have only continued their steady pace of executions and their standard pattern of passing them off as “justifiable homicides” and “unexplained incidents”. The cold blooded execution of Chavis Carter in Jonesboro, Arkansas is the most graphic case in point. On Sunday, July 29th, Jonesboro Police claimed that 21-year old Carter shot himself in the head, after being searched twice, while handcuffed in the back of a squad car. To date, despite national media coverage and sustained pressure from local forces, the case is proceeding in standard fashion. The two officers responsible for Carters execution, Keith Bagget and Ron Marsh, are on paid leave until internal investigations by the Jonesboro PD and the FBI are complete. And Chavis Carter was not alone. Javon Neal, 16, was executed by Tampa, Florida police on Sunday, July 22nd. James Harper, 31, by the Dallas police on Wednesday, July 25th. Julius Richard Larrance, 19, by Police in Clearwater, Florida on Thursday, July 26th. Darius Kennedy, 51, in NYC, NY on Saturday, August 11th. And, Christopher Middleton, 26, in Maywood, IL on Sunday, August 12th. These killings only reaffirm the findings in our report that Every 36 Hours a Black person is killed by the police in the United States. Clearly, just publicizing these extrajudicial killings of Black people is not enough. More must be done to protect Black life and secure justice for our people. 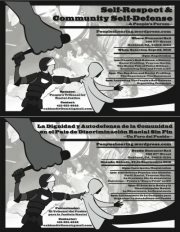 In response to the Anaheim, California Police Departments extrajudicial killings of two Latino men, Manuel Angel Diaz, 25 and Joel Acevedo, 21 on July 21st and 22nd respectively, the Latino community in Anaheim engaged in a sustained direct action mobilization against the police department and Anaheim city officials for well over two weeks. Latino residents and their allies used a range of tactics including marches, rallies, sit in’s, a picket of Disneyland and occupations of intersections and police and city offices to ensure that business could not proceed as usual to guarantee that their issues were addressed. In addition to the intolerable police killing of at least five Latinos in the past year, the mobilizations drew attention to the vast inequality between white and Latino communities of Anaheim and the colonial status of Latinos who comprise 54% of the population and have virtually no representation in City government. In many respects, the Anaheim mobilization mirrored the dynamic community response in Oakland, CA in 2009 and 2010 following the cold-blooded execution of Oscar Grant. Of the major mobilizations against police terrorism and extrajudicial killings over the past 10 years, the Anaheim-Oakland models of sustained community pressure are the ones we, in the Malcolm X Grassroots Movement, think merit the most attention by the social justice movements contained in the United States. The Anaheim-Oakland models provide a direct means to addressing extrajudicial killing, police terrorism, and other forms of containment aimed at oppressed peoples and communities that community members can directly control and dictate. The strength of the model is that it is not dependent on legal proceedings or on elected politicians, but upon the commitment and initiative of the people themselves. Despite its strengths, the Anaheim-Oakland models have their weaknesses. Their main weakness is that mass mobilizations, while they can and often do prompt social change, in and of themselves don’t provide direction or structure to the change. That only comes from mass organization that is able to impose its will on the state and the ruling classes to adhere to the program and demands of the movement. The launching of campaigns for local referendums to institute Police Control mechanisms – i.e. community based structures that have the power to hire, fire, subpoena, and discipline the police. Forming People’s Assemblies, on local, city-wide, and regional levels to engage in program and demand development initiatives that will structure the development of a Peoples’ National Plan of Action for Racial Justice and Self-Determination and the broad implementation of people’s programs for self-defense and mutual aid. Black or New Afrikan people are not the only targets of this escalation of Extrajudicial Killing by the Police and other forces of the government. Indigenous peoples, Latinos, Arabs, Southeast Asians, Muslims, and immigrants, are also being targeted. In fact, given the current climate of xenophobia and racial hostility directed towards Latinos, we suspect that the numbers of those stolen from Xicano/Mexicano and Central American communities will equal, if not exceed those of Blacks. When you consider the overall manner in which racial profiling has intensified since September 11, 2001, and how it has been supported by the phenomenal growth of the national security industry and the ever increasing means of surveillance, it becomes clear that the extrajudicial killings of Blacks, Latinos, and others are about as accidental as the more the 2 million Black people incarcerated or under some form of direct state control throughout the United States. Extrajudicial killing and mass incarceration are two sides of the same coin. Together they are just one dimension of the overall strategy of containment rooted in the systemic and institutional practices of white supremacy and colonialism that give form to the national oppression of Black, Xicano, and Indigenous people. The Malcolm X Grassroots Movement, is calling for a broad alliance of Blacks, Indigenous peoples, Latinos, Arabs, Asians, and progressive whites that will challenge the various forms of state repression, including extrajudicial killing, racial profiling , mass incarceration, mass deportation, economic exploitation and various forms of displacement. It is our hope that this peoples’ alliance will form the core of the People’s Self Defense Networks and the broad People to People coalitions that will build the People’s Assemblies and develop the National Plan of Action for Racial Justice and Self-Determination. To launch this process, the Malcolm X Grassroots Movement, working with allies in the Black Left Unity Network and the National Alliance for Racial Justice and Human Rights, is calling for a series of dialogue calls to initiate a national process of organizing, networking, and coalition building to create the aforementioned Networks and start the process of developing a Peoples’ National Plan of Action for Racial Justice and Self-Determination. We will be hosting our first Black/Afrikan People’s Dialogue on Thursday, August 30th. We will be hosting our first All Peoples’ Dialogue on Thursday, September 20th. To join these calls please contact Kamau Franklin at kamauf@mxgm.org. For more information about the campaign visit http://www.mxgm.org. To sign the petition for demanding a National Plan of Action http://www.ushrnetwork.org/content/webform/trayvon-martin-petition.